No matter what you say or how you look at it, girls and boys are different in certain ways (although some might say much more than one would dare to imagine). Having said that, if you were to develop a particular game or toy for girls, you would not be able to apply the same line of thought as that with boys, since they do seem to think different on a fundamental level. VTech knows this, which is why their Flipsies happens to be a new, truly innovative play experience that offers an empowering message for girls. Flipsies have been specially developed and refined through years of research into what girls and parents want, and this has allowed VTech to identify an opportunity in order to satisfy an unmet demand and yet do their part to inject innovation into the girls’ toy aisle. Flipsies offers a great play experience by combining traditional role play with collectible dolls and accessories with VTech’s proprietary MagicPoint interactive technology. With Flipsies, girls are encouraged to dream big, as they get to enjoy endless ways to play with unique features that capture a child’s imagination and revolutionize the play experience. There will be eight introductory themes available that offer a positive aspirational message through the encouragement of girls so that their dreams can shine, allowing them to be anything that they want to be, regardless of whether she is going to grow up to be a doctor, a marine biologist, teacher, baker, rock star, veterinarian, fashion designer or even a princess. Transformation features merged with interactions between the characters and playsets via MagicPoint locations will do its bit to enhance the play value, letting girls imagine living out their dreams. 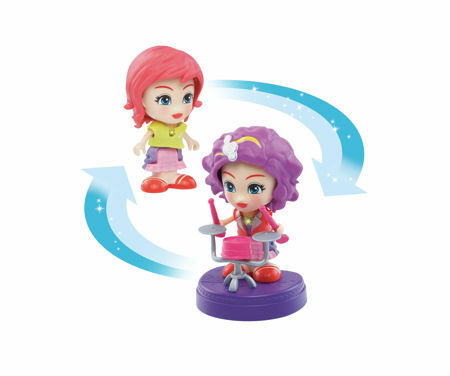 Every Flipsies doll and playset will offer not only real world but dream world modes too, where MagicPoint locations that elicit unique phrases from the Flipsies dolls to stimulate fun, imaginative role play while encouraging girls to reach for the stars. Makes perfect sense for VTech to come up with Flipsies, since they are no stranger to the children’s toys market.